A few years ago I tuned in to a televised sermon from a highly acclaimed pastor leading one of the nation's largest mega-churches. The pastor talked a lot about faith, but not the kind I'm used to hearing about. In my opinion, that morning he wasn't preaching faith in the Savior (which I know he preaches sometimes), but faith in yourself. Not just faith in yourself, but also faith in other mortals, helping them to look past their problems and see that they can do great things if only they will believe in — you guessed it — themselves. I agree that we should encourage others and be positive, but that's about all there was to this sermon. Without the foundation of true faith in Christ and repentance of our sins to follow Him, none of us will come anywhere close to realizing our potential. The broadcast looked and sounded like a typical motivational speaker for corporate America, but given to a huge audience (about 44,000 people in the stadium that used to house the Houston Rockets). 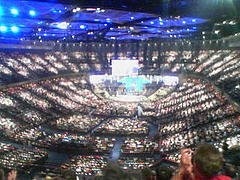 Mega-churches draw such large crowds because they make you feel so good. It could have been Anthony Robbins or some other feel-good and believe-in-yourself cheerleader raking in megabucks for an hour or two of inspirational froth. Not that delusional, greed-based froth doesn't have an important place in religion. I missed the first couple of minutes, so there might have been some heavy references to Jesus and the Bible before I tuned in, but during more than 20 minutes of preaching I can only remember one such reference. The popular pastor told people that having faith in others is like what Jesus did with Peter. He said that when Jesus met Peter, Peter was rough and used foul language (?). But Jesus looked past all that and believed in Peter, and told Peter that he had the talent, the skills, and the personality (?) to be a great disciple, and through this encouragement, Peter was able to go on and become great — presumably by believing in himself. I got out my LDS printing of the Bible and thumbed through the Topical Guide trying to find references to personality, believing in yourself, and Peter's foul language, but I guess we Mormons are using one of those Bibles with a lot of stuff subtracted from it. I get the feeling that the financial pressures that mega-churches face — just think of the air conditioning costs for such a large church — might have a profound effect on what gets preached. Sadly, I think this is the problem we find in some corners of modern Christianity. A core element of the Gospel has always been that man must repent. We must have faith in Christ and repent of our sins and follow Him. Repentance would be a more common message if only it didn’t inevitably lead to recognizing that some things are sins. Sin, that’s the sticking point. Opposing it is rarely good for popularity or profits. To actually preach repentance, one must denounce sin. Not abstract sin, not the sins of other people, but our own sins, personal sins, even our favorite ones. Ouch. Repentance hurts. In fact, it begins with pain, the pain that tells us we are not right with God and have done something wrong that we are responsible for. Not what the masses want, I’m afraid. Yes, repentance involves pain, and good preaching and a true Christian ministry can and sometimes should induce genuine pain in the hearts of the hearers, especially when they are engaging in serious sin, as Jacob found in Jacob 2 in the Book of Mormon. Such preaching makes people uncomfortable because we all have sin. Kudos to those churches and religions that boldly teach repentance. However, in my experience in the northern Midwest especially, as conservative and religious a place as that is, it seemed rare to find a preacher teaching his or her people that it's a serious sin to live together before marriage, for example. It's easy to find preachers who are totally cool with that and can meet with and counsel young people for months as they plan their marriage without ever telling them to repent and begin on a stronger foundation by not shacking up first. Pastoral silence on this topic is not blessing the lives of the people. Have faith in Christ, repent and be baptized. It's the basic message of Christianity. And one that still needs to be restored in many quarters. We also need to do a better job of emphasizing this message in some LDS quarters. It's too often that we have sacrament sermons that are also contaminated with pop psychology and feel-good fluff off the Internet rather than being rooted in scripture, where the call to repent is one of the most repeated messages of all. You'll get plenty of calls to repent from the leaders of the Church, especially in General Conference, but how are we doing in our own circles of responsibility? Are we helping our families and those we are responsible for to understand the need to repent and the dangers of sin? True faith in Christ leads to repentance, something we can't afford to stop teaching. Of course, the first place to begin is in our own lives as we examine our relationship to God and our daily need to be led out of temptation, to be delivered from the evil around us and in our lives, and to draw closer to the Savior through faith in him and regular repentance.